So if we have both add and update methods I could claim it’s not quite a collection-like interface, right? I shouldn’t need to bother checking if an object’s already there when adding to a set-like collection. Collection-oriented repositories really try to mimic an in-memory collection, so you shouldn’t need to re-add an object if it has been updated but already existed in the collection. The repository (or layers hidden below it, such as an ORM) should take care that changes to an entity are tracked. You just add an object when you first create it and then no more methods are needed after the entity is changed. Persistence-oriented repositories are aware that an object needs to be explicitly “saved” after changes are made, so you call save with an entity when it is created or when it is changed. delete is fine, but perhaps remove would be a better name. Domain events express facts that happen in the domain and thus are first class citizens of the domain so there are very very important from the DDD point of view. Even more, when interfacing with another bounded context, they could represent the contract between the two bounded contexts. P.S. they are covered by the "red DDD book" in chapter 8. From my experience, people tend to implement an address as an entity because of the persistence: it is easier to persist an address as a sub-entity to a relational database than to persist a value object because of the entities ID that act as primary keys in the storage table. However, there are tactics that permit storing a value object as an database entity but still using it just as a value object, as it should be. Vaughn Vernon shows how to do this in his book, Chapter 6, sub-chapter Persisting Value Objects. In a nutshell, Process Manager deals with multiple processes concurrently via Process instances that it creates when a specific process is initiated. Id of a Process instance is your Correlation Identifier that is part of the payload of every communication (commands/events) in the duration of the process. There is another term for Process instance, that is Process Tracker. The idea is the same. So in this approach, there is a clear separation of concerns. Every Process Instance is responsible for its own process in terms of its current state, retries, finishing etc. It is a Process Instance that is responsible for emitting ProcessFinished event since it is the "brain". Another name for Process Manager is Long Running Process. So by definition, it is better be asynchronous. First and classic book (be aware that it's very general). As for something practical you can check out this book or just google for some online examples. As mentioned by @inf3rno in Access Control in Domain Driven Design, Vaughn Vernon briefly touches upon this in his book Implementing Domain-Driven Design. Security and permissions should be centralized in its own bounded context, which is then used by other bounded contexts. Have a look at the Identity Access bounded context for inspiration, but I recommend following Schneier's Law, which states that you should not build your own security system. So where should I put the access control logic? According to this: https://softwareengineering.stackexchange.com/a/71883/65755 the policy enforcement point should be right before the call of the UserService.editProfile(). I came to the same conclusion: it cannot be in the UI because by multiple UIs we would have code repetition. It should be before the creation of domain events, because they indicated that we have already done something in the system. So we can restrict the access to domain objects or to services which use those domain objects. By CQRS we don't necessary have domain objects by the read model, just services, so we have to restrict access to the services if we want a general solution. We could put the access decisions at the beginning of every service operation, but that would be grant all, deny x security anti pattern. How should I implement it? By identity based access control (IBAC) we have an identity - permission storage (access control list, capability list, access control matrix). So for example by an access control list, we store the list of the users or groups whose can have permissions. By role based access control (RBAC) we define subject roles and we grant permissions to subjects whose act the actual role. By attribute based access control (ABAC) we define subject, resource and environment attributes and we write our policies based on them. By policy based access control (PBAC) we don't assign our policies to anything else, they are standalone. By risk-adaptive access control (RAdAC) we base our decision on the relative risk profile of the subject and the risk level of the operation. This cannot be described with rules I think. I am unsure of the implementation, maybe this is what stackoverflow uses by its point system. So everybody who knows the 2683fraicfv8a2zuisbkcaac token can use the service. There are many other models, and the best fit always depends on the needs of your customer. - "security concerns should be handled outside the domain"
- "access control requirements are domain specific"
both can be right, because security is not part of the domain model, but its implementation depends on the domain model and the application logic. This constitutes a new Bounded Context - the Identity and Access Context - and will be used by other Bounded Contexts through standard DDD integration techniques. To the consuming contexts the Identity and Access Context is a Generic Subdomain. The product will be named IdOvation. So according to Vernon probably the best solution to move the access control to a generic subdomain. a) This is not a strict constraint, but offers certain advantages. The idea behind the rule is that domain services contain functionality that supplements existing entities and value objects. Another non-strict constraint is closure of operations where both the argument and the return value of domain service methods are of the same type. Both of these constraints promote immutability and a functional style thereby reducing side-effects and making it easier to reason about the code, refactor the code, etc. It is possible to have a domain service method that accepts a primitive type which is neither an entity or value object. However, extensive use of primitive types can result in primitive obsession. b) This constraint can be applied at the entity and value object level to an extent. Entities and value objects compose more primitive types to form complex types and some behaviors may depend on a primitive parameter. This primitive parameter can itself be turned into a value object. 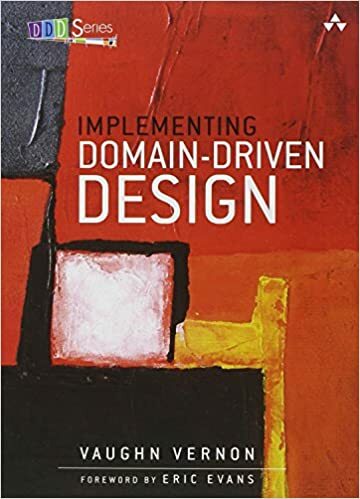 Just returned from DDD meetup where I had a chance to talk this over with Vaughn Vernon author of Implementing Domain-Driven Design. He agrees that the specified constraint is not strict. In other words, there are scenarios where it is perfectly acceptable for a domain service method to be parameterized by primitive types. How do the two constraints promote immutability? The idea is that a domain service does not mutate state and all state changes are made explicit through parameters. This is the essence of a pure function. Given that domain services complement entities, their methods should be expressed in those terms. I'm referring to functional programming. Programming in a functional style usually entails immutability and pure functions. Another trait of a functional approach is a declarative style contrasted with imperative. No. If a primitive type suffices for an operation there is no reason to coerce it into something else. The use of entities and value objects is only a guideline and some prefer to be more strict than others. Some, for instance, use an explicit type to represent identities for each entity. So instead of using int you'd create a value object called OrderId to represent an identity of an order. So is it due to some sort of intrinsic characteristic of Domain Entities/Value objects that in most cases their behaviors ( ie their operations ) operate on primitive types ( ie use primitive types as parameters )? I wouldn't say it is intrinsic to DDD. I was referring to the more general idea of composition - complex entities (non-DDD) are composed out of simpler ones. By this token, it makes sense that operations on complex entities would be expressed in terms of constituent parts. a) A domain service can avoid state mutation by returning new instances of objects instead of modifying the objects that were passed in. In this way, the signature of the method fully describes what it does because there are no side-effects. b) A domain service can mutate state of an object passed to it, in which case the return type would likely be full. This however is less desirable - it would be better for a DO to mutate its own state. c) Yes that is part of it. Immutability and purity allow you to refactor code much like you would factor an algebraic equation with substitution. Another reason is that it makes reasoning about the code easier since if you look at a piece of immutable data you can be certain it doesn't change for the remainder of its scope. d) Yes, although in that case it would be better for the domain object to mutate itself. This mutation would be invoked by a surrounding application service. A lot of times I pass domain services to entity behavior methods to provide them functionality they don't have access to directly. e) The notion of closure of operations does not in and of itself promote immutability but it is a characteristic of immutable code. The reason is that a if a domain service method accepts a value of type T and returns a value of type T it can indicate that it returns a new value of T resulting from the encapsulated operation. This is a characteristic of immutability because the change resulting from the operation is made explicit as a new object. a) This has more to do with traditional OOP than it does with DDD. OOP tries to hide the moving parts behind objects - encapsulation. FP tries to minimize the moving parts - immutability. Immutability can be seen as more "natural" in some scenarios. For example, in event-centric scenarios, events are immutable because they are a record of what has happened. You don't change what has happened, but you can create compensating actions. b) Again, this has more to do with OOP than DDD and is based on the information expert pattern which essentially states that behaviors on data should be as close as possible to that data. In DDD, this means that an entity should encapsulate the contained data as much as possible so that it can ensure its own integrity. The whole Chapter 6 of Eric Evans book is devoted to the problems you are describing. There are many ways to design FACTORIES. Several special-purpose creation patterns - FACTORY METHOD, ABSTRACT FACTORY, and BUILDER - were thoroughly treated in Gamma et. al 1995. <...> The point here is not to delve deeply into designing factories, but rather to show the place of factories as important components of a domain design. A FACTORY reconstituting an object will handle violation of an invariant differently. During creation of a new object, a FACTORY should simply balk when invariant isn't met, but a more flexible response may be necessary in reconstitution. You can create a separate FACTORY and document it so that developers should only use it only for persistence or testing. You can set the private field values with reflection, as for example Hibernate does. Regarding the anemic domain model with setters/and getters, the upcoming Vaughn Vernon book criticizes this approach a lot so I dare say it is an antipattern in DDD. Usually DTOs have no logic (or very simple transformation logic, such as returning a person's age from a date of birth). You can use the pattern you have there... definitely, it's just that the objects are not really DTOs but more rich objects (that's usually good). You're not adding a 'DTO' suffix to you class names, so I would say that you're doing fine, because a Request object could have some behaviour. I see what you're trying to do. It's possible to do using Dependency Injection + AOP, but I think there are other patterns that might have a more clear distinction and a lot less black magic. With the approach you want to use, your Request is the entry point to your application (to the core of your domain) and represents the use case you want to run. The approach I usually use, which is based on Domain-Driven Design (DDD) and Hexagonal Architecture, is to have DTOs which might some kind of binding to the transport technology (for example xml/json annotations). And I use a layer of Application Services which serve as a façade into the domain logic. The Application Service is just responsible for orchestration, not for business logic. As part of the orchestration, the Application Service needs to get a reference to an object that does have the business logic. In DDD these objects are usually Aggregates. I think I would write a lot more about this, but there are already quite a few really good resources explaining how to design good applications, and the explanation there is way better than what I can do here :). If you are interested in this, and don't mind spending a bit more time (and maybe a few bucks). I strongly suggest you to get a copy of Growing Object-Oriented Software and Implementing Domain-Driven Design. Both are excellent books, very easy to read, and luckily all the examples are in Java.